Call (860) 563-3303 today to schedule your appointment! Do you need an experienced dentist who can take care of your entire family? We are Rocky Hill’s most trusted dental team and are fully qualified to treat patients of all ages in one comfortable place. 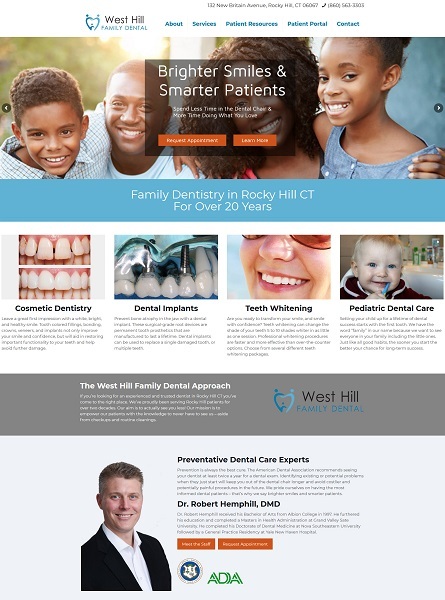 In fact, Dr. Robert Hemphill brings a diverse skill set in modern dentistry, allowing him to perform general, restorative and cosmetic treatments. This is as well as offering dental implants, orthodontics and more. Our dental team knows that your teeth and gums have specific and widespread needs at each stage of life. We have designed our practice to handle them all. At West Hill Family Dental, we give every patient the opportunity to have a healthy, confident and lasting smile. The health of your smile is the foundation of your overall health. Therefore, we take our job seriously when it comes to protecting and repairing your teeth from damage. Our Rocky Hill office offers everything from routine cleanings and fillings to chipped tooth repair, TMJ treatment and emergency care. We even offer some of the most preferred options in implant dentistry, including the Prettau® implant-supported bridge. If you’d like to boost your smile confidence, we invite you to explore our full menu of cosmetic dentistry services, ranging from teeth whitening to porcelain veneers. When choosing West Hill Family Dental, you can always expect to be kept comfortable at every step. We offer soothing amenities throughout our office as well as sedation dentistry to eliminate your pain in the dental chair. Call today to schedule your appointment. You’ll quickly discover that our commitment to superior family dental care is unrivaled in the Rocky Hill area.